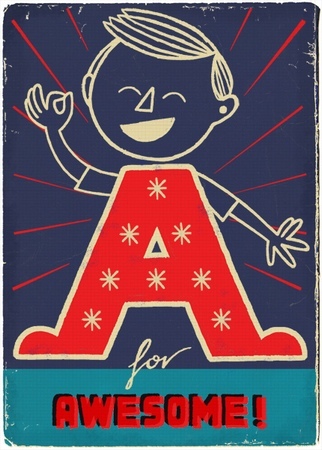 An awesome alphabet by Paul Thurlby. Using the alphabet as a decorating feature for the nursery is literally centuries old. From needlepoint samplers to fabulous modern posters, children have learnt their ABCs in an enormous variety of styles. Now you can add a little retro-inspired signage to the mix. London based illustrator Paul Thurlby has created a set of alphabet prints that are bright yet subdued and modern but with a distinctly retro edge. I like the fact that there is not an ‘apple’ or ‘zebra’ in sight. Instead, ‘A is for Awesome’ and ‘Z is for Zipper’ – cool. Adorn the nursery wall with your child’s initials, their whole name or do as India Knight did. One of Thurlby’s more well known fans, she covered a wall with the whole alphabet (the result is stunning). Each letter is limited to 200 prints. All are signed and numbered. Individual letters are £30 each, including postage to Australia. If you buy two, the third print is free.